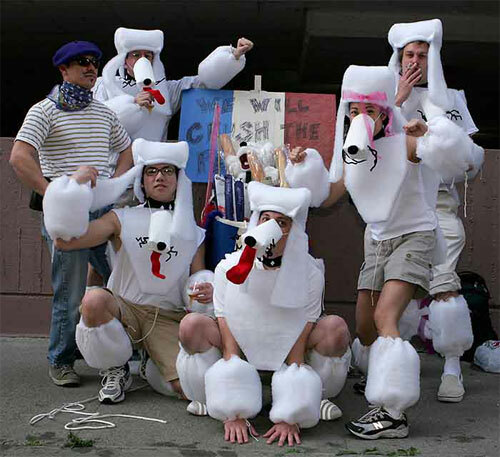 12th Annual Urban Iditarod takes place this Saturday, March 4th in the streets of San Francisco. The “dogs” and their “sleds” will meet up at 12 noon and mushing will begin promptly at 1pm. Here’s more info on registration. In the Alaskan Iditarod, more than sixty dog sled teams race across the frozen tundra from Anchorage to Nome. In our urban version, teams of “dogs” lead by a musher will pull their sleds (shopping carts) through some of San Francisco’s most touristed areas. These teams of barking humans must negotiate through the unrelenting and unforgiving dangers of San Francisco’s urban frontier. As an incentive to run, dogs and mushers alike will have several rest stops to replenish lost fluids and discuss tales of mayhem. The course is over three miles, so dogs and mushers alike need to be ready and able to run their tails off. Joe Reifer shot some great photos at last year’s Urban Iditarod 2005. UPDATE: Here are some photos from Urban Iditarod 2006.